This beautifully preserved Victorian era pub has served a lot of drinks in its 150 years on a discrete Darlinghurst corner. 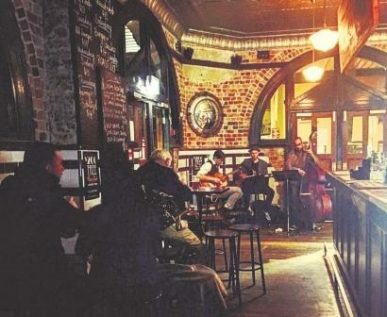 The exposed brick interior, varnished wood trim, old world decor and ornate ceilings give it a nostalgic charm, classy but not snobby, making it a popular hang out for locals and out ‘o towners alike. Indoor/outdoor dining and a basic, thorough menu give it multi-seasonal appeal for a range of palettes, or you can sit on the wide second storey balcony, sipping slowly on a cocktail while the city winds down around you. Every night of the week there’s a menu special; Monday to Friday you can enjoy cheap beer, wine and spirits during Happy Hour(s) 4 to 6pm; from Thursday to Sunday The Green Door cocktail bar has evening specials on their signature and classic cocktails. There’s a weekly trivia challenge; pool comp; live musos playing chill jazz; and live DJs pumping out the beats. Available for functions too. The locals want to keep this place a secret… good luck with that.